FIGURES IN A LANDSCAPE (1970). Director Joseph Losey has been responsible for plenty of great films. Beginning in Hollywood, and moving overseas after getting blacklisted in the '50s (for refusing to testify before those HUAC shitbags), his best-known pics include Pinter-scripted fare like ACCIDENT and THE GO-BETWEEN, as well as more eccentric outings like MODESTY BLAISE. This is another atypical endeavor, based on a novel by Barry England, and pairing a pre-JAWS Robert Shaw with a young, A CLOCKWORK ORANGE-era Malcolm McDowell... The plot is deceptively simple, as two prison escapees try to make it across 400 miles of rugged wilderness on foot, through mud, rain, snow, and the occasional bullet. It's survival of the smartest, as this pair -- initially handcuffed from behind -- match wits against an omnipresent pursuit helicopter. Shaw (who also wrote the script) is the grizzled MacConnachie, while McDowell plays the wimpier Ansell. We never learn exactly who Mac and Ansell are, why they were imprisoned, or whether it was for political or criminal reasons. Keeping us in the dark, Losey strips the story to its essentials, forcing us to deal head-on with the leads' grueling physical ordeal, as they steal food and an old rifle, and become uneasy traveling companions. 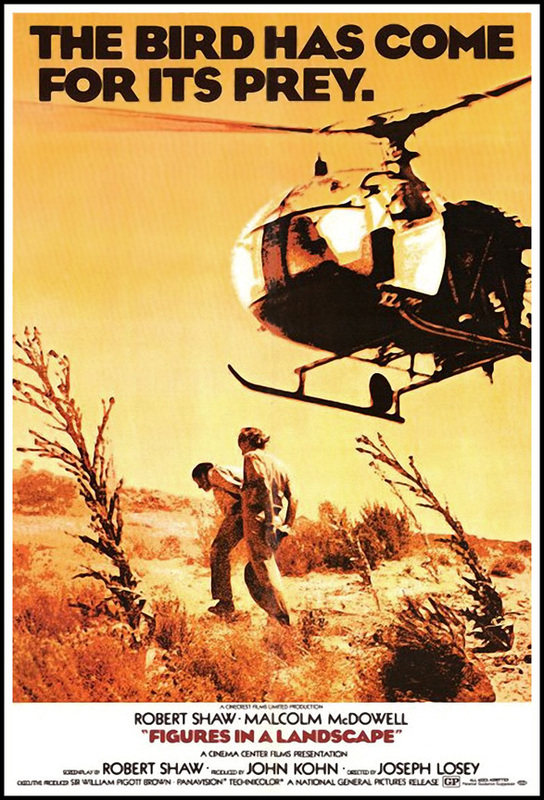 Stretched to nearly two-hours, they avoid foot soldiers, run from fire bombs tossed into the high brush, and Mac eventually shoots one of the helicopter's crew... Shaw is restrained for much of the film, while McDowell practices the type of sniveling which would typecast his later career. Both characters remain frustratingly underdeveloped, but when Mac becomes obsessed with killing this flying beast, you can definitely see the genesis of his Quint. What makes this film work as well as it does is the astounding helicopter footage and ever-changing terrain. The photography by Henri Alekan (Cocteau's BEAUTY AND THE BEAST) and Peter Suschitzky is breathtaking, as the chopper skims the earth, stalking the pair as they cross this harsh landscape. And like these never-seen helicopter pilots, everyone else in the film is 'faceless', with eyes obscured by sunglasses or goggles. In the end, this is a stark adventure, but also so heavy with pretension that it's difficult to care much about the outcome.